Artists & Makers Studios on Parklawn Drive and Wilkins Avenue in Rockville are featuring three exhibits at two locations. These three exhibits will open First Friday festivities between 6-9pm on August 3rd, and will showcase resident artists’ open studios for browsing as well. 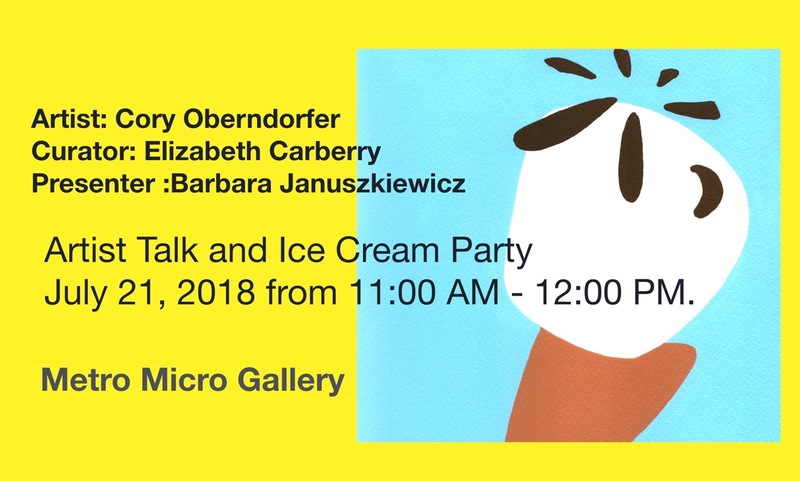 Artists & Makers Studios 1 on Parklawn hosts a three gallery invitational exhibit with the Olney Art Association, along with Theremin music by Arthur Harrison as well as resident artists’ open studios. Additionally A&M2 on Wilkins is proud to present the work of Cherie Redlinger & Klaudia Levin, as well as a solo exhibit of the work of Jabari C. Jefferson. Also enjoy a new exhibit by the 21 member artists in Gallery 209, an exhibit with the Montgomery County Camera Club “Architectural Design”, and resident artists’ open studios - all just 9/10’s of a mile from the flagship location on Parklawn with free parking at both locations and the best parties in town. These exhibits at both locations open Friday, August 3rd, and continue through Wednesday, August 29th, 2018. Viewing hours coincide with office hours and are 10:00 AM – 4:00 PM, TuesdaySaturday, and Sundays/Mondays by chance or appointment. Artists & Makers Studios on Parklawn Drive in Rockville, established in October 2014 by artist and arts community builder Judith HeartSong, is a 13,000 sq. ft. facility is now home to 66 resident artists. Artists & Makers Studios 2 on Wilkins Avenue in Rockville is a 23,000 sq. ft. facility with 95 resident artists and more to come. A&M Studios is dedicated to providing a supportive and vibrant environment for artists to realize their creative goals - through studio practice, collaboration, education, opportunities, networking and connecting with the community beyond our doors. Seasonal Art Installations (Fall 2018). Application Exhibition Dates: Friday, October 5th – Monday, November 26th, 2018. Application Fee: $25 application fee. $10 for artists with a current lease or sublease at the Torpedo Factory. Request for Proposals (RFP): The Torpedo Factory Art Center (TFAC), presently managed by the City of Alexandria Office of the Arts, invites artists and artist teams (Artists) residing in Virginia, Maryland, and the District of Columbia, to submit proposals for the Torpedo Factory Art Center’s temporary art installations to activate the building’s main spaces during the fall. Artwork is encouraged but not limited to involve themes related to fall/autumn, folklore (such as Dia de los Muertos or All Hallow’s Eve), or Alexandria’s naval history. These themes will correspond to different programming that will be happening in the Art Center for the duration of the exhibition. Deadline: Mon, September 10th, 2018. The Center for Contemporary Political Art. ABOUT THE EXHIBITION: The Age of Trump has brought unprecedented uncertainty and crisis to Washington. This Open Call challenges America’s artists to respond with Art as powerful as the times are dangerous, to help Americans understand what’s at stake---and why it’s their duty to vote---in the November 2018 mid-term elections. Because of its scope, timing and institutional backing, The Center is hopeful its first, Defining exhibition will lead to a redefinition of the role artists play in our society; identify the country’s leading practitioners of political art; and demonstrate why political art should be recognized as a valued genre of American art in the 21st Century. Frank prefers to think of these paintings as “badart,” one word, no hyphen. Badart is not the inverse of “good art”; it’s the inverse of “important art.” Some might call these pieces outsider art, and in the past, many of them could have been termed primitive or art brut. I prefer to think of them as ugly. Charming—like the dancing dog wearing a tutu or the nineties eyebrows on one particularly serene Virgin Mary—but ugly nonetheless. Read the entire and interesting article here. Middle Tennessee State University Department of Art and Design Todd Art Gallery, Murfreesboro, TN 37129 1:00 p.m. Opening Reception, Sat., September 22, 2018 Todd Hall, Todd Art Gallery, Room 224A Related workshops follow 12 CUBED is juried and composed of works that have not exceeded 12” in any dimension. $1,000 Best of Show Award. Jo Weiss, Nestled, 2017. Courtesy of the artist. Four women artists convincingly place human figures in space, each reaching that high-water mark of Western Art in their own way. Kiley Ames has a seemingly rational, systematic technique akin to pointillism that on closer inspection emits an emotional charge. Jo Weiss’s expressionist, emotional process ultimately reveals an analytical, orderly understanding of figures in space. Janice Nowinski’s paintings are brushy, mysterious, and unexpected portrayals of men in ambiguous situations. Kyle Staver’s technique is smooth and sophisticated, serving up darkly humorous tales of violence and sensuality. These artists create narratives that open our world to reflection and engagement in a way that abstraction cannot manage. The Maryland Department of Commerce is seeking qualified applicants for a full-time, contractual, Office Secretary III within its Division of Tourism, Film and the Arts’- Maryland State Arts Council (MSAC). The primary function is to provide administrative services and support to the staff, as well as, serve as a central customer service representative for MSAC. The incumbent aids in the development of monthly fiscal reports; proofs complex reports; reconciles database information with the State's accounting system (FMIS); completes research within FMIS; composes documentation to accompany contracts; and drafts routine correspondence; prepares information packets; maintains various online databases; assists with scheduling and logistics for panels and meetings; prepares meeting support materials; and attends and assists with special event set-up and break-down. The individual receives guests, communicates with internal and external customers regarding a variety of tasks and actions; frequently interacts with high level executives within industry, academia and government; answers the main phone line providing information to callers; responds to walk-in inquiries from the public; and receives and distributes mail and packages. In addition, this position will ensure tidiness of common areas, maintain stock and inventory, organize office supplies, and serve as the liaison for MSAC building management. Some Statewide travel and evening hours may be required. The selected employee will be well organized, able to work independently, have an aptitude for detailed work; possess proficiency with Microsoft Office (Word, Excel, Access, and PowerPoint), Google Mail and/or other relevant programs; possess strong interpersonal, written, and oral communication skills; have the ability to effectively present information, explain policy, respond to internal and external inquiries; and complete concurrent and high priority tasks. Experience: Three (3) years of experience performing secretarial or clerical work involving use of a computer. Notes: 1. Additional secretarial or clerical experience may be substituted on a year-for-year basis for the required education. 2. Thirty credit hours with a major in secretarial science or office technology from an accredited college may be substituted at the rate of thirty credits for one year of experience for up to two years of the required experience. 3. Candidates may substitute U.S. Armed Forces military service experience as a non-commissioned officer in Administration classifications or Administrative, Clerical, or Office Services specialty codes in the Administrative Support field of work on a year-for-year basis for the required experience. Experience working in the public or non-profit arts sector. Use of MS Office Suite to design, create, and/or manage documents, databases, spreadsheets, and reports. Experience providing guidance & responding to inquiries from external/internal customers. Experience organizing and managing multiple projects. Please note that your answers on the Supplemental Questionnaire must correspond to the information provided on your resume to receive credit. Interested and qualified candidates should submit their resume AND completed supplemental questionnaire to Anna Halikias at Anna.Halikias@maryland.gov by the closing date listed below to receive consideration. Please describe in detail any job duties relating to the qualifications stated. We thank our Veterans for their service to our Country and encourage them to apply. Please describe your three years of experience performing secretarial or clerical duties involving typing/data entry. Include details pertaining to software applications/computer use, job title, employer name, dates of employment, and hours worked per week (this information must be reflected on your Resume, to receive full credit). If you do not have this experience, please indicate N/A. Do you possess experience working in the public or non-profit arts sector? If yes, please provide employer name, job title, duties, dates of employment, and hours worked per week. If no, please indicate N/A. Please explain in detail, your experience using Microsoft Office Suite - Excel, Word, Access, Powerpoint to design, create, and/or manage documents, databases, spreadsheets, and reports. Please include the name of your employer, job title, job duties, dates of employment, and hours worked per week. If you do not have this type of experience, please write N/A. Please describe you experience organizing and managing multiple projects. Art dealer claims contents of storage locker he bought for $15,000 includes six Willem de Koonings. A New York art dealer claims that the contents of a New Jersey storage locker he bought for $15,000 includes six works by the famed painter Willem de Kooning. Last year, David Killen, who runs a showroom and auction business in Manhattan, bought the contents of a storage unit in Ho-Ho-Kus, New Jersey, that contained some 200 works from the studio of the late art conservator Orrin Riley, who founded the Guggenheim Museum’s conservation department before launching his own private restoration business in Manhattan. Heading to my daughter Elise's wedding reception! The exhibition includes never before displayed items provided by architect Steven Spurlock, who worked with my good friend Sam Gilliam for more than 20 years. For many artists, making the transition from gallery to public art is about growing awareness of their work, and larger paychecks. For D.C. arts legends Rockne Krebs and Sam Gilliam, public artworks were not only an important component of how they made a living, but a compelling motivator in their artistic development. Rockne Krebs (1938-2011) was a sculpture wunderkind, whose early success was compounded by timely experiments with technology. Krebs career started with plexiglass and aluminum sculptures that exploded the viewer’s sense of their own location, and in 1968 Paul Richard wrote in the Washington Post that Krebs early work, “exhibits an intensity and restraint that is rare indeed.” In 1973 Krebs began to create “Sculpture without object” – primarily works made with lasers. His first experiments (in DC) turned into city wide installations across the country, and globe. This exhibition features public artworks built and unbuilt; proposals never funded, and proposals and documentation of works that came into being. Sam Gilliam (1933 – ) is a DC artistic legend who became famous for his color-washed canvases removed from the stretcher. In 1971, Paul Richard in the Washington Post wrote that Gilliam’s swooping canvases, hung from walls and ceilings, “have the look of revolution, old conventions overturned, the past abandoned.” Gilliam’s early success opened the door to public art commissions, and a DC gallery owner connected Gilliam with architect Steven Spurlock to help the artist with his first proposal preparation. Over the next twenty years, as he independently rose to leadership as an architect, Spurlock continued to assist Gilliam, and the exhibition includes the architect’s never-before-displayed drawings, plans, and photographs. The exhibition will be on display in the Washington Studio School’s Gallery, at 2129 S Street, NW Washington, DC 20008, from July 19 to August 3rd, 2018. An opening celebration and gallery talk are to be scheduled. A catalog, including essay by John Anderson (Washington City Paper, reSculpture), is being produced for the exhibition. The project is funded through a grant from the DC Commission on the Arts to project director Robert Bettmann, and produced through partnerships with the non-profits Day Eight and The Washington Studio School. The mission of Day Eight is to empower individuals and communities to participate in the arts through the production, publication, and promotion of creative projects. For more information, visit dayeight.org. 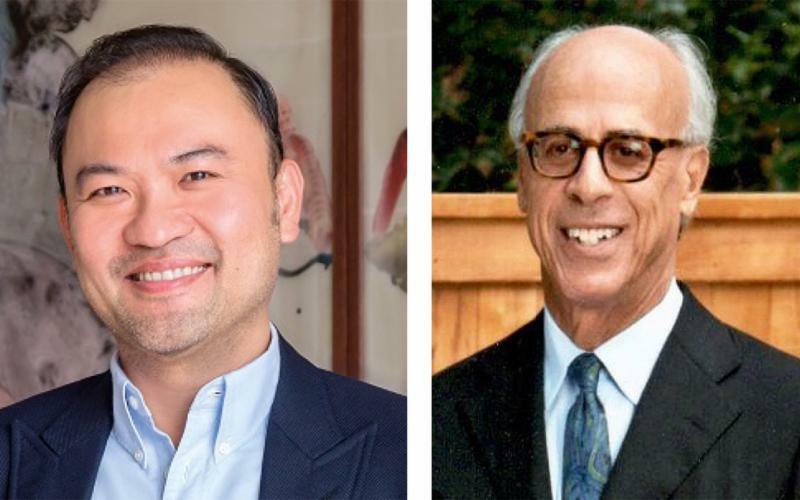 The addition of Disaphol Chansiri of Bangkok and Steven M. Sumberg of Washington, D.C., brings the total membership of the board to 33. Under Hirshhorn Director Melissa Chiu, the board has seen its fastest growth in the museum's history, with 27 new additions in the past four years alone. "Disaphol and Steve bring unique and rich perspectives, which will help us to grow our international engagement," said Board Chair Daniel H. Sallick. "Their collective contributions both nationally and internationally are inspiring, and we look forward to working together to advance the Hirshhorn's mission." "The Hirshhorn is delighted to welcome Disaphol and Steve to the museum," said Hirshhorn Director Melissa Chiu. "Both trustees, with their incredibly diverse backgrounds, bring a knowledge of development, community engagement and sustainability, which will be an integral asset as we continue to grow and expand in the coming years." Disaphol Chansiri is based in Bangkok and is the Chief Executive Officer of DCA Group, encompassing real estate firms in Thailand. Disaphol also serves as a Chairperson in Master of Taxation Law on the Faculty of Law at Assumption University, President of the Chansiri Group of Companies, and Legal Advisor to the Chairman of the Thai Union Group Public Company Limited. Disaphol is also a board member of the Thailand Philharmonic Orchestra and President of the Sheffield Wednesday Football Club in the United Kingdom. Disaphol holds a Ph.D. in Law and Diplomacy from the Fletcher School of Law and Diplomacy at Tufts University. He published a book titled The Chinese Émigrés of Thailand in the Twentieth Century. Disaphol has collected art for over twenty years and has private collection spaces in both Bangkok and Chiangmai, which he makes available for public viewing. Steven M. Sumberg received his MBA and JD at Washington University (St. Louis), a Master's in English Literature at Georgetown University and a Bachelor's in Political Science at Brown University. Sumberg is currently the Chairman and co-owner of Rapid Funding LLC and has previously worked as the President and sole owner of the Mann Corporation (1987-1991). Sumberg has dedicated his career as a real estate developer specializing in renovating and developing commercial properties, throughout the metropolitan Washington D.C. area. An active member of the community, Sumberg has owned and managed numerous apartment buildings, shopping centers, warehouses, and development sites for over thirty years. An avid art collector, Sumberg has supported major institutions such as LACMA, the Corcoran Gallery, and most notably our own programs at the Hirshhorn. He is currently a member of the District of Columbia and Illinois Bar Associations, and the Hirshhorn Collectors' Council. The Bethesda Arts & Entertainment District is currently seeking applications for up to six artists to rent studio space at the new Triangle Art Studios, located at 7711 Old Georgetown Road, Bethesda, MD in the Cheval Bethesda Condominiums. Artists must be 18 years of age or older and be residents of Washington, D.C., Maryland or Virginia to qualify for studio space. Studios will be available for occupancy beginning in late summer 2018 and the deadline to apply is Friday, July 27, 2018. Triangle Art Studios has three available art studios that may be shared by two artists or rented by an individual artist. Rent is inclusive of all utilities including power, Wi-Fi, security system with alarm, etc. Each individual studio has its own HVAC unit, restroom, utility sink and front door which opens directly onto the paseo. There is no application fee, so please share this opportunity and encourage all to apply here before July 27, 2018 if interested. Application Deadline July 25th at 4:30 pm! The deadline to apply for a 2019 Maryland State Arts Council (MSAC) Individual Artist Award (IAA) is fast approaching. IAAs recognize outstanding artistic achievement, honor the contributions artists make to our state, and are accompanied by unrestricted grants of $1,000, $3,000 or $6,000 to help artists advance their craft. Visit MAAF's website (opens in a new window) to access the Program Guidelines and the link to the online application. Artists' royalties when their work is resold. A U.S. Court of Appeals judge has struck down the final effort to have artists receive royalties when their work is resold. The case eventually landed at the Ninth Circuit of the U.S. Appeals Court, where it was once again struck down on Friday, effectively ending the fight for artists’ resale royalties. The National Gallery acquired an artwork made by a female artist for the first time in 27 years! Artemisia Gentileschi’s Self Portrait as Saint Catherine of Alexandria (1615-17) has become the first artwork by a female artist to the permanent collection of the National Gallery in London in 27 years. The work is only the 21st painting made by a female artist to enter the institution’s permanent collection; less than one percent of the National Gallery’s 2,300 artworks were made by a female artist. Los Angeles is getting a new art fair, started by collector Dean Valentine, which will run during Frieze L.A. This February marks the first edition of Frieze Los Angeles, the London-based fair juggernaut’s attempt to turn the world’s entertainment capital into a new stop-off on the global art market circuit. And now it will have a new satellite fair to help create an enticing critical mass for collectors: Felix LA, a quirky, 35-gallery expo that will be held in the Hollywood Roosevelt Hotel, the refurbished 1920s deco hotel on Hollywood Boulevard. Felix LA is spearheaded by television executive and art collector Dean Valentine. It will open February 13, the day before the public opening of Frieze’s L.A. fair, which will be held at Paramount Studios—just a 12-minute Uber away from the Roosevelt (well, unless you get stuck in that notorious L.A. traffic). Call for Entries for LISTEN UP! Photoworks Gallery announces a Call for Entries for LISTEN UP!, their 2018 Juried Youth Photography Exhibition. This exhibit and competition - their 6th Annual Juried Show for Young Photographers - comes at a time of unprecedented student involvement and activism and students are encouraged to submit their work, and their perspectives, to this year's show. The competition is designed for students of photography aged 18 and under and past year's selected photographs have been taken by students as young as 10 years old. For detailed instructions on submitting your work click here! The Bethesda Arts & Entertainment District and the Bethesda Urban Partnership will showcase the work of The Trawick Prize: Bethesda Contemporary Art Awards eight finalists in a group exhibition. The exhibit will be on display Sept. 5 – 29, 2018 at Gallery B, located at 7700 Wisconsin Avenue, Suite E. The award winners will be announced on Wednesday, September 5, 2018. The Best in Show, first place winner will be awarded $10,000; second place will be honored with $2,000 and third place will be awarded $1,000. The public opening reception will be held Friday, September 14 from 6-8pm. Gallery hours for the duration of the exhibit are Wednesday through Saturday, 12 – 6pm. The 2018 Trawick Prize jurors are Christopher Bedford, Director of The Baltimore Museum of Art; Sukjin Choi, Head of Ceramics and Associate Professor of Art at James Madison University; andValerie Fletcher, Independent Art Historian and Senior Curator Emerita at the Hirshhorn Museum. Founded by the amazing Carol Trawick in 2003, the regional competition is one of the largest prizes to annually honor visual artists. Ms. Trawick, a longtime community activist in downtown Bethesda, also established the Bethesda Painting Awards in 2005. She has served as the Chair of the Bethesda Arts & Entertainment District, Bethesda Urban Partnership, Strathmore and the Maryland State Arts Council. She founded the Jim and Carol Trawick Foundation in 2007 to assist health and human services and arts non-profits in Montgomery County. The Foundation has awarded grants to more than 90 nonprofits in Montgomery County and funds the annual Trawick Prize and the Bethesda Painting Awards. 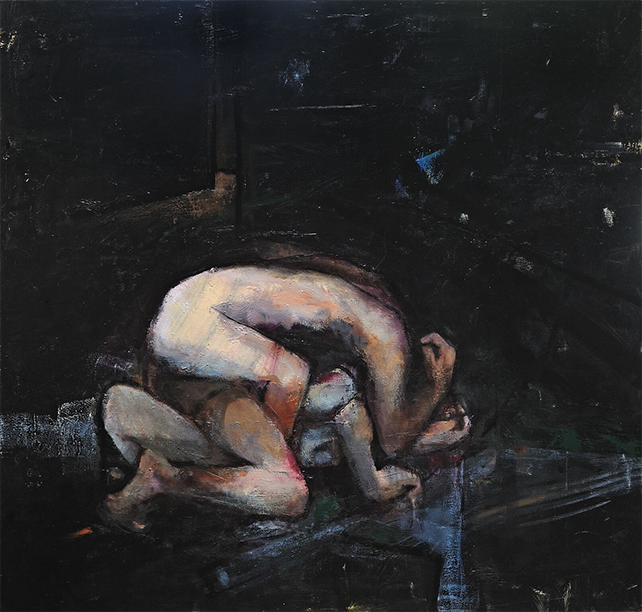 To date, The Trawick Prize has awarded more than $220,000 in prize monies and has exhibited the work of more than 135 regional artists. Previous Best in Show recipients include Richard Clever, 2003; David Page, 2004; Jiha Moon, 2005; James Rieck, 2006; Jo Smail, 2007; Maggie Michael, 2008; Rene Trevino, 2009; Sara Pomerance, 2010; Mia Feuer, 2011; Lillian Bayley Hoover, 2012; Gary Kachadourian, 2013; Neil Feather, 2014; Jonathan Monaghan, 2015; Lauren Adams, 2016 and Larry Cook, 2017. For more information, please visit www.bethesda.org or call 301-215-6660. While investigating the plastic pollution in our oceans, Kirsty Little kept coming up against numbers that she could not comprehend. Americans use 35,000,000,000 (35 billion) plastic bottles each year. Trillions of micro plastics virtually invisible to the human eye are being eaten by plankton and working their way up the seafood chain to our plates. We have barely reduced our plastic footprint since plastic production began 50 years ago. Only 9 to 25% goes into recycling. The rest ends up in our oceans and landfills. Kirsty Little’s installation in the 355 Pod Space located on Route 355 near Rockville Town Square is one of the ways that she is working to raise consciousness about plastic pollution. She wants people to think about how many plastic items they use once and then discard. She wants to sensitize people to the costs of careless consumption and disposal of plastic. To make this installation possible, Little worked with over one hundred people who collected plastic lids and caps from their households and helped her construct individual numbers overflowing with plastic. Once people started collecting plastic, they began to see it everywhere in their daily lives. The plastic used in this project filled every room in Little’s house. This is a tiny personal portion of the plastic garbage generated every second all over the world. About the artist: Kirsty Little is a former circus aerialist based in the United Kingdom for two decades when a move to United States in 2011 led her to find a new path in the art world and change her style of performance. She is drawn to working with themes of motherhood, personal identity, anatomy and the struggling environment. She makes sculpture with porcelain, wood and wire, and more recently, plastic and fish installation, focusing on the oceans present pollution crisis. She is resident artist at Otis St studios and teaches aerial dance at Upspring studios. She is in the Guinness book of World Records for directing the most aerialists choreographed on silks. Recently she performed at The Theatre Project in Baltimore in aerial collaboration with Jayne Bernasconi. Her sculptural installation, ‘Refuse?REFUSE, 1T’ has been on display at Red Dirt Studio, Harmony Hall, and next at Up Studio. She has taken this work into her daughter’s school, galvanizing the students to collect lids and make ‘500 Million’. Opening reception and artist talk: Friday, July 13, 7 – 9 PM. My Name is Frank James from Washington DC. I have been on the lookout for some artworks lately in regards to I and my wife's anniversary which is just around the corner. I stormed on some of your works which i found quite impressive and intriguing. I must admit your doing quite an impressive job. You are undoubtedly good at what you do. With that being said, I would like to purchase some of your works as a surprise gift to my wife in honor of our upcoming wedding anniversary. It would be of help if you could send some pictures of your piece of works, with their respective prices and sizes, which are ready for immediate (or close to immediate) sales. My budget for this is within the price range of $500 to $5000. 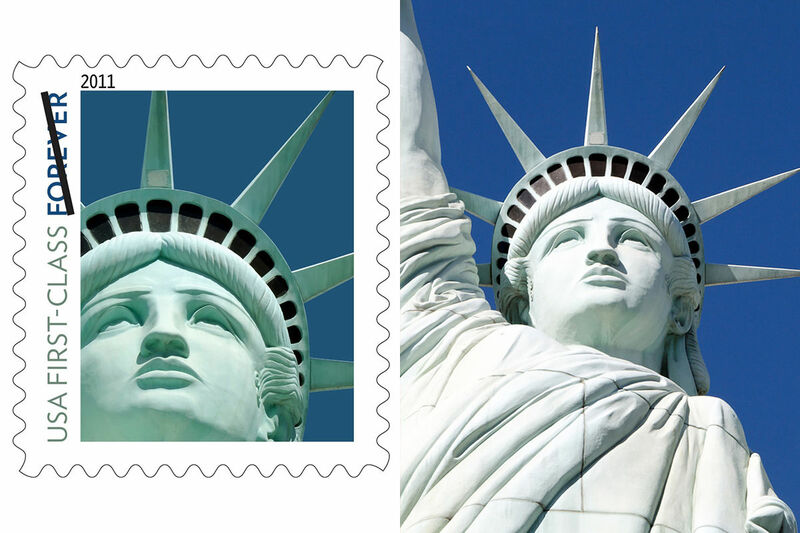 However, the artist who made the Vegas sculpture, Robert S. Davidson, did not love the USPS using an image of his work without obtaining permission and sued for copyright infringement in 2017. Last Friday, Davidson emerged victorious from the suit and will now receive $3.5 million, plus interest, as compensation. I met author Robert Heinlein and his wife Virginia when I was a student at the Naval Postgraduate School in Monterey, California in the 1980s. He died the second year that I was at NPS. His classic A Stranger ina Strange Land remains one of my all time faves. All exhibitors forfeit the right of reproduction of their work to the _____________. The ____________ reserves the right, and all exhibitors grant the ______________ the right, at the discretion of the ___________, to use all works of design or art, and any related materials provided to the _____________ by any exhibitor, for its own business, promotional, and archival purposes. 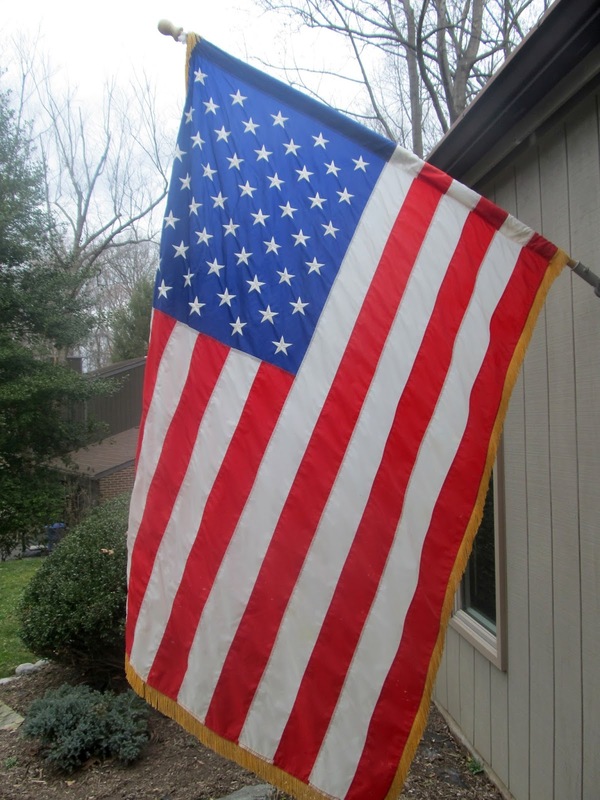 The American flag that I sometimes hang outside my house has a most interesting story. As you can see below, it is a gold-fringed flag, which we used to call "a Navy flag" back in the days, because of who knows why... when I was an Executive Officer at the Naval Security Group Activity Skaggs Island, California in the 1990s, I was told that it was because it represented the ability to execute/hold a Captain's Mast. But I meander away from the history of this flag... my flag. 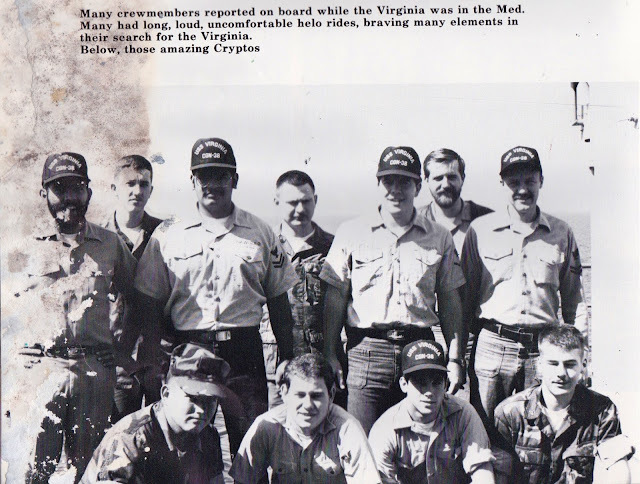 In 1983 I was the OZ Division Officer for USS Virginia (CGN-38), and the ship was assigned Naval Gunfire Fire Support (NGFS) patrol off the coast of Beirut, Lebanon, in support of the US Marines ashore in Beirut as part of the Multi-National Peacekeeping Force. We would routinely fly ashore for meetings, etc., and one day I will scan and show you a description that I put on my journal (in pre-blog days) many years ago where I described one such meeting and the interesting event that happened, with 50 cal bullets flying all over the place. 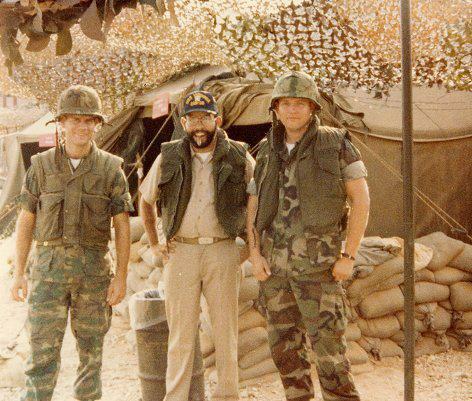 Below is a picture of me, ashore in Beirut with the USMC. At 6:22 on Sunday morning Oct. 23, 1983, a 19-ton yellow Mercedes stake-bed truck entered a public parking lot at the heart of Beirut International Airport. The lot was adjacent to the headquarters of the U.S. 8th Marine Regiment’s 1st Battalion, where some 350 American soldiers lay asleep in a four-story concrete aviation administration building that had been successively occupied by various combatants in the ongoing Lebanese Civil War. Battalion Landing Team 1/8 was the ground element of the 1,800-man 24th Marine Amphibious Unit (MAU), which had deployed to Lebanon a year earlier as part of a multinational peacekeeping force also comprising French, Italian and British troops. Its mission was to facilitate the withdrawal of foreign fighters from Lebanon and help restore the sovereignty of its government at a time when sectarian violence had riven the Mediterranean nation. ... Marine sentries initially paid little attention to the Mercedes truck. Heavy vehicles were a common sight at the airport, and in fact the BLT was expecting one that day with a water delivery. The truck circled the parking lot, then picked up speed as it traveled parallel to a line of concertina wire protecting the south end of the Marine compound. Suddenly, the vehicle veered left, plowed through the 5-foot-high wire barrier and rumbled between two guard posts. By then it was obvious the driver of the truck—a bearded man with black hair—had hostile intentions, but there was no way to stop him. The Marines were operating under peacetime rules of engagement, and their weapons were not loaded. Lance Corporal Eddie DiFranco, manning the sentry post on the driver’s side of the truck, soon guessed the driver’s horrifying purpose. “He looked right at me…smiled, that’s it,” DiFranco later recalled. “Soon as I saw [the truck] over here, I knew what was going to happen.” By the time he managed to slap a magazine into his M16 and chamber a round, the truck had roared through an open vehicle gate, rumbled past a long steel pipe barrier, threaded between two other pipes and was closing on the BLT barracks. Sergeant of the guard Stephen Russell was alone at his sandbag-and-plywood post at the front of the building but facing inside. Hearing a revving engine, he turned to see the Mercedes truck barreling straight toward him. He instinctively bolted through the lobby toward the building’s rear entrance, repeatedly yelling, “Hit the deck! Hit the deck!” It was futile gesture, given that nearly everyone was still asleep. As Russell dashed out the rear entrance, he looked over his shoulder and saw the truck slam through his post, smash through the entrance and come to a halt in the midst of the lobby. After an ominous pause of a second or two, the truck erupted in a massive explosion—so powerful that it lifted the building in the air, shearing off its steel-reinforced concrete support columns (each 15 feet in circumference) and collapsing the structure. Crushed to death within the resulting mountain of rubble were 241 U.S. military personnel—220 Marines, 18 Navy sailors and three Army soldiers. More than 100 others were injured. It was worst single-day death toll for the Marines since the World War II Battle of Iwo Jima. Aboard USS Virginia, the ship's crew went into action, and within minutes our helo was airborne, carrying our ship's doctor and his Navy corpsmen to help with the wounded Marines. Minutes later the helo came back, looking for people and equipment to help assist with digging out the people from the collapsed building. Because my division was the only one that had an Arabic linguist, they came to us to see if he (Sgt. Bobby Jack Irvin, an amazing linguist and as far as I know the only Marine ever to qualify for the Enlisted Surface Warfare pin) could go ashore to help facilitate our doctor's mission, as he had radio'd that several Lebanese doctors had already come up to help him, and he might need language help. Irvin and I had been ashore the day before (that's him in the photo a few paragraphs above - Irvin is to my left and to my right is Warrant Officer Carnes), but because of our shipboard mission, I felt that he could really help more by staying on the ship and doing what he did best. Later on, they asked for volunteers to help ashore, and together with some other crew members, we headed to Beirut - other than Irvin, I was the only person on the ship who routinely flew back and forth between Beirut and the ship, and thus I wanted to ensure that I was part of the volunteer crew. When we arrived at the airport, it was essentially controlled chaos, and dozens of bodies were already being tended to, and our ship's helo - along with others - began taking the wounded to a hospital in Sidon. There were also plenty of black body bags already filled. With our doctor (whose last name I recall as Warner) frenetically working to triage the wounded Marines, and since most Lebanese doctors actually spoke English, after donating blood, I left the medical area and began to help with the digging operations. This story is not about that part, which was brutal and heart-breaking. This story is about the flag that I found in the rubble. At the time, it seemed like a natural thing to "rescue" it from the rubble. I brought it back to the ship, where it flew often, as our mission shifted from routine patrol to Naval Gunfire Support (NGFS). When I left the ship, it was given to me, along with a ship's plaque. When I retired from the Navy two decades ago, I used it as my retirement flag and it was presented to me again, after flying over the Capitol - I never put it in a shadow box, as is the custom, but kept it flying every once in a while, as a flag deserves to do. A few years ago, when I hung it outside, it dawned on me that the history of this flag should merit some notice, and reached out to the Marine Corps Museum to see if they wanted it as a gift, but they declined, so now I'm actively seeking a place of honor for it. To me that flag represents all those young Marines (average age 19) who died in that cowardly attack. It is one more reason why I stand, put my hand on my heart, take my cover off, and face the flag when the National Anthem plays at an event. Be a part of Bazaart –​ ​American Visionary Art Museum's annual holiday marketplace of original creations by regional artists and craftspeople. The market features the artsiest arts & craftiest crafts, ranging from painting to sculpture to jewelry to handmade clothing and accessories. For more information, click here. Through a unique public-private collaboration between the Silver Spring Urban District, Silver Spring Arts and Entertainment District, DGS, and Washington Property Company, the Silver Spring Arts and Entertainment District is seeking design proposals for a two-dimensional, outdoor, large-scale public art mural. For more information, click here. The Maryland Theatre in Hagerstown seeks an artist to create a permanent indoor light fixture to be installed on the top floor event space within the expansion of the historic theatre. Work should be completed or well underway by Winter 2019. The call is open to all artists living within a 100-mile radius of The Maryland Theatre. For more information, click here. Email naomi@mdartplace.org with information you would like included in the Resource Bulletin. MSAC wants to hear from you! The Maryland State Arts Council (MSAC) is listening and wants to hear from you! Four sessions of "We Are Listening" were conducted and MSAC received an overwhelming response for each session. Participants were able to voice their feedback on the Individual Artist Awards, Arts in Education initiatives, Accessibility, Veterans and the Grants for Organizations programs. All the information is being compiled and reviewed for the strategic planning process. Feedback is still being received. If you have comments you would like to share, please email msac.commerce@maryland.gov with the subject heading FEEDBACK and the name of the program. Session feedback can be found here. The Atomic Dog and Consequential Cat art exhibit at the Veterinary Clinics of America Alexandria Animal Hospital (VCA Alexandria) features Del Ray Artisans members’ artwork of our furry friends. The exhibit is part of Del Ray Artisans’ Gallery Without Walls (GWW)program in partnership with VCA Alexandria and includes a selection of canine artwork from this past May’s Atomic Dog exhibit, plus hand-picked artwork honoring our feline companions. The artwork will be displayed on the walls of the VCA Alexandria Animal Hospital from June 11 through September 30, 2018. VCA Alexandria Animal Hospital is located at 2660 Duke Street, Alexandria, VA 22314. For questions, contact VCA Alexandria staff at 703-751-2022 or 703-823-3601 or Del Ray Artisans’ GWW curator, Monica Hokeilen, at GWW@DelRayArtisans.org.